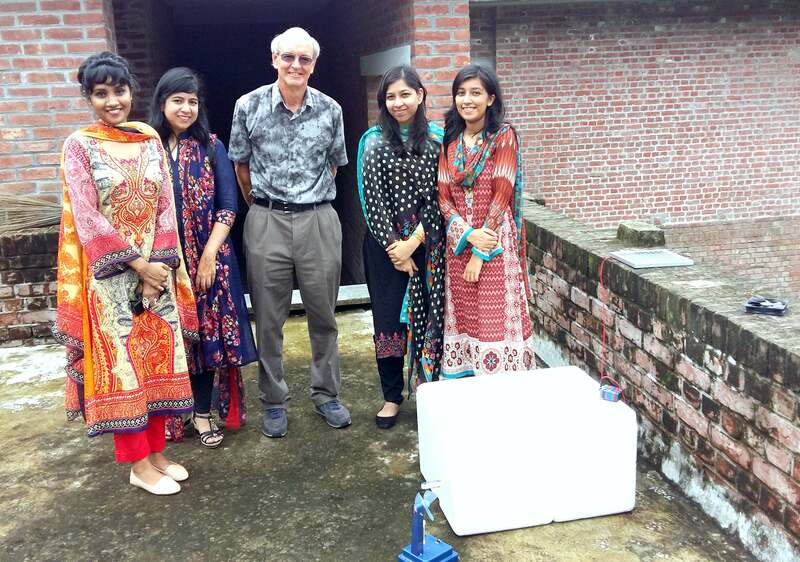 The FreshFood team with Dr. Michael Reid from UC Davis. Millennial food innovators are pioneering a better food future from farm to fork. Our Millennial Innovators Uprooting Our Food System series profiles the bright, creative and driven university students from around the world that make up Thought For Food (TFF), a next generation food innovation platform. A global community as well as a summit and business competition, TFF empowers breakthrough solutions to feed nine billion people by 2050. During this series, we will highlight the work of select TFFers who are working to transform our food system. 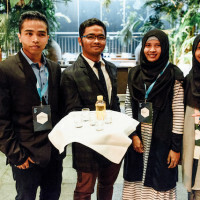 This week we chatted FoodFresh, a startup founded by University of Dhaka students Samiha Zaker, Rubyat Tasfia Rahman Shaily, Shafinaz Hossain and Lamia Anwar Shama in Bangladesh after winning the 2014/15 Thought For Food Challenge grand prize. 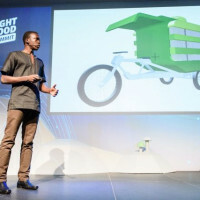 FoodFresh’s solar-powered evaporation cooling system aims to lower post-harvest losses of fruits and vegetables; It’s targeted at small-scale farmers and market vendors. Our interview has been edited for brevity. Thought For Food: What impact do you hope to have in food security? FoodFresh: We live in Bangladesh, a country where millions go to bed hungry each night but discarded produce lies at the side of the road because farmers are unable to store the harvest. The situation is aggravated by the addition of lethal preservatives by the vendors to store the produce, which directly affected us, the end consumers who were caught in a spiraling web of unsafe food. By designing FoodFresh to reduce post-harvest loss and prolong shelf life, we hope to give back farmers the bargaining power they currently lack. 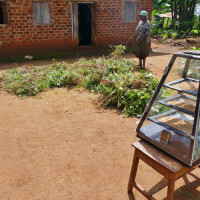 Most farmers have no electricity or the budget to buy a refrigerator. They are compelled to sell their produce right after harvest to avoid financial losses, and they fall prey to exploitation by multiple levels of intermediaries. With FoodFresh farmers can store harvests for up to a week, eliminating the need to resort to harmful preservatives. TFF: What is your business model? Through our partnership with USAID’s Agricultural Value Chain, which constitutes four million farmers in twenty districts of Bangladesh. We will use sales agents to reach market vendors and partner with NGOs to build customers. TFF: FoodFresh was selected as the winning team for TFF Challenge. What was that experience like? FF: The TFF Challenge was a milestone for FoodFresh where we transformed and saw steep growth. When we started FoodFresh, it was just an idea, but through the brainstorming, prototyping and pitching sessions that came with the participation in the Challenge, it became a reality. The TFF Summit was an inspiring and fun experience, to meet and work alongside globally diverse, but like-minded individuals who share a passion for food security. Winning the Challenge was entirely beyond our expectations and reaffirmed our belief that we were going the right direction. Not only did we receive immense support and encouragement from the best people in the industry, we got to learn and forge lifelong connections with the wide TFF community. TFF: 2015 has been a massive year of growth for FoodFresh. What can we expect to see from you in the future? FF: Initially, we are being very conservative with funds from the TFF Challenge, using it for testing and designing new prototype iterations to customize the product for different fruits and vegetables. We’ve also been conducting market research and field tests in rural areas of Jessore, Bangladesh among tomato farmers. At the moment we are in the R&D phase, using FoodFresh in the field with different products and in different environments. We are setting up a pilot test with 100 farmers, which will provide insights and feedback for our next prototype. TFF: What advice do you have for other millennial students eager to build food business? FF: Being an entrepreneur is difficult. It’s even more difficult when you are a student and have to juggle assignments and meetings all at once. But once you have made up your mind, stick to it no matter how hard it gets. Find an experienced business executive or a college professor who believes in you and your startup, then set up regular meetings to talk about your business goals. Accept feedback and adapt accordingly. You might refuse help because you think it makes you look weak or incompetent, but proactively seeking feedback from your peers and network will benefit you in the long run.